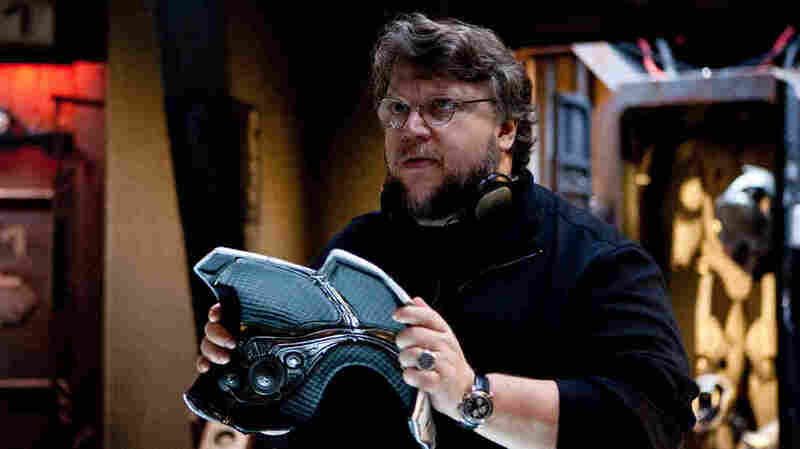 Guillermo Del Toro, On Monsters And Meaning The director talks to NPR's Audie Cornish about Japanese cinema, growing up watching kaiju films like Godzilla in Mexico, and his new action epic, Pacific Rim. A child of the '60s and '70s, Guadalajara-born director Guillermo del Toro has been a fan of the Japanese kaiju film tradition since he was a kid. His latest movie, Pacific Rim, is his passion project and homage to the genre. From the audience-pleasing Hellboy to the critically acclaimed Pan's Labyrinth, Guillermo del Toro's movies are chock-full of mystical, often terrifying creatures. Now the Mexico-born director has made a big-budget entry in the genre that helped define his fascination with the monstrous: the Japanese kaiju films of the '60s. Pacific Rim, out this weekend, is a rock-'em sock-'em robots-vs.-monsters epic in which human-piloted "Jaegers" defend the coasts against an apocalyptic invasion of kaiju, or strange beasts, from the sea. Del Toro talked to NPR's Audie Cornish about Japanese cinema and our complicated relationship with science and technology, the difference between straight-up monsters and good-guy kaiju, and the "one-brick cinemas" where he learned to appreciate the finer aspects of the B-movie experience. 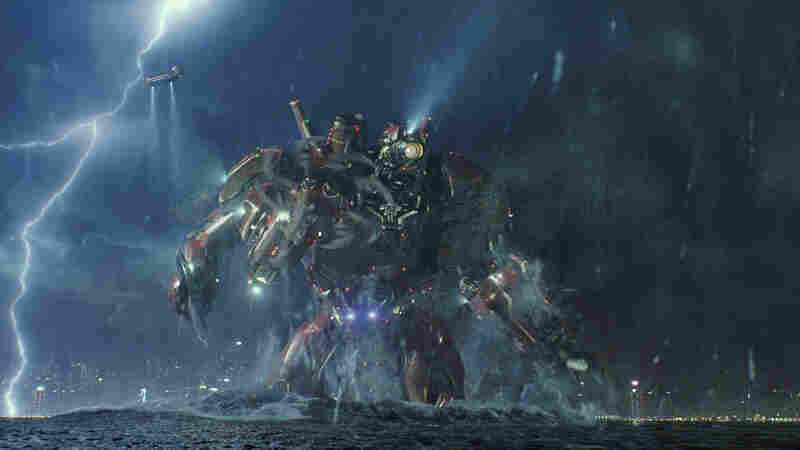 The Jaegers of del Toro's Pacific Rim are inspired by the mecha tradition in Japanese cinema. "The way they transported me, the way they made me feel in awe of these gigantic creatures strolling across the ocean, coming into the city — it's unlike any Western movie genre ever." "[Kaiju films] mostly didn't play in the A circuit, so I was going to B-circuit cinemas. ... In Mexico we call them a one-brick cinema, 'cause they used to give you a brick for the rats. ... That was the nickname the theaters had." "I think kaiju are sort of the revenge of kids — because we are born in a world we don't fit in, a world that is too big for us. And I think kaiju are then sort of the ultimate avengers of size. They make adults feel inadequate all over the world. There is always that fantasy — there's primal fantasy, certainly for a male child ... where you give them a robot and a dinosaur, and the instinct is just to have them fight. It's truly a primal thing." "There was an implicit code in watching these movies, even as a kid, where I knew they were miniature. They were miniature cities, miniature planes, miniature tanks. So there was no real-life impact to me. They became spectacles, almost ballets of elemental creatures — elementals of nature, going through this sort of destructive opera." "The aliens always have a map to a single city in the world — New York. Every alien invasion gets one map on the way here." "I happen to believe that family is the source of all the joy and all the horror in our lives — both. That's my starting point in every tale. I don't do it intentionally, but ... every deficiency we have in our social or personal behavior comes from a moment that is rooted in our childhood. And I love to explore the idea of either conquering that fear or dealing with it very pointedly. "Mako, in Pacific Rim, brings that cycle to an end ... in that she's finally facing the very monsters that took everything from her. And I tried to make that moment almost like a fairy tale moment. In that scene she is almost like a little princess being rescued by a knight in shining armor, from a dragon. and there is a breath of almost poetic beauty to the scene."